Big Island police have arrested a 21-year-old Hōnaunau man for a vehicle break in and an unrelated burglary on Tuesday (August 10). Tuesday afternoon, Kona patrol officers in Captain Cook observed a vehicle matching the description of a car that had been driven by an unknown suspect in an unauthorized entry of a motor vehicle case earlier in the day in Captain Cook. 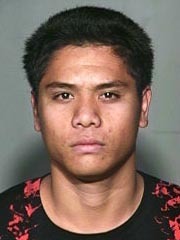 Officers identified the driver as Drosstain Pua, who was wanted on a bench warrant for contempt of court. They arrested him on suspicion of unauthorized entry of a motor vehicle and charged him with contempt of court. Detectives from the Area II Criminal Investigations Section obtained search warrants for the car and located stolen property that had been taken in the unauthorized entry of a motor vehicle case and property taken in a burglary the same day in Captain Cook. At 2 p.m. Thursday (August 12), Pua was charged with unauthorized entry of a motor vehicle, first-degree burglary, two counts of second-degree theft and promotion of a detrimental drug. His bail for all charges, including contempt of court, was $131,000. Pua is being held at the Kona police cellblock pending a court appearance.